By now all the data must have been analysed to the last details and some of the analyst will definitely try insulating you from the disaster and loss of face that has happened for your party and more specifically for u !! Just hope that you realize within a short span of 16 months since you came to power in May 2015 the public has rejected the growing intolerance, religious bigotry and the polarization of us as Indians on communal lines. What worked for you in Gujarat from 2002 do not and cannot be replicated on a Pan India basis. You will have to take all the constituents together be it the minorities, opposition and the disgruntled sections of the society, mere words do not matter they have to be backed by actions. The public voted you in for development and good governance, so plz start delivering them and get out of the campaign mode and into that of able administrator. You do not have to win all state elections personally, leave that for the state leadership. So start delivering and stop campaigning !! Many Many congratulations for the spectacular win in these elections!! It is unprecedented in the history of state elections where the anti incumbency in a state of Bihar is just not an issue and people have voted your alliance with an over whelming majority. The people have reposed faith in your leadership and administration. I have just one humble request that you both prove the previous example of the Janta Pariwar wrong and stay together and not squabble over petty issues. The issue of CM is settled so Lalooji plz act like a big brother so guide & cooperate with Nitish Babu to provide governance to Bihar and to pull it out of BIMARU state category and be a showcase for the other CM’s. Let this be the beginning of the end of the communal politics in India and your state be the torch bearer of this mission. You have risen like the Phoenix, after everyone had written you off after the 2014 debacle. 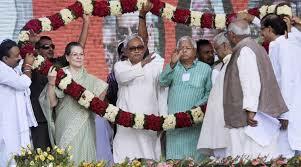 It is only because of your initiative the ‘Mahagathbandhan’ was put in place and was able to stop the Modi juggernaut in Bihar and to put him on a back foot country over. Congress has made mistakes in the past but the party has learned and moved on and like how!! The only way forward is to take along the non communal forces together for that is what the people of India deserve and need and we are so proud that Dr. C P Joshi ji a leader from our region of Rajasthan i.e. Mewar was in charge of the congress campaign in these elections. You all have it got it horribly wrong!! You cannot do any forecast irrespective of your methodology , sample size , experience and the certification from Yogendra Yadav ji. For you it’s just a guessing game and who ever claims to get it right is just a matter of luck and fluke, PERIOD !! Only thing you are good at doing are postmortems which even I am good at as you can see from the above letters to the three principal players of the Bihar Elections !! जो लौह-ऐ-अज़ल पे लिखा है , हम देखेंगे …..